This recent autumn was the best year for pomegranates. The tree planted by the pond in the garden seven or so years ago has been flourishing in this strange weather we’ve been having. Oft times, at harvest, the fruits would be cankered with the befouling kisses of some strange bug, with brown patches and tell-tale black pinholes on the thick red rinds. No such plague this year, thankfully! The pomegranates I plucked were larger and far sweeter than ever before – crimson globes hung like giant Christmas ornaments on the tree that’s grown nearly taller than the house. I’ve been fixated on their magic this year especially, and feel so grateful to have this gorgeous tree growing near me, feeding me and my loved ones with her bounty. 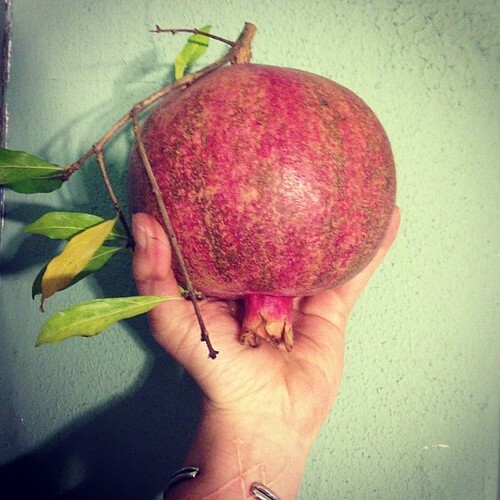 In honor of this grand tree and her marvelous fruit, I’ve compiled some of my favorite poems, writings and images inspired by the magic of the pomegranate. 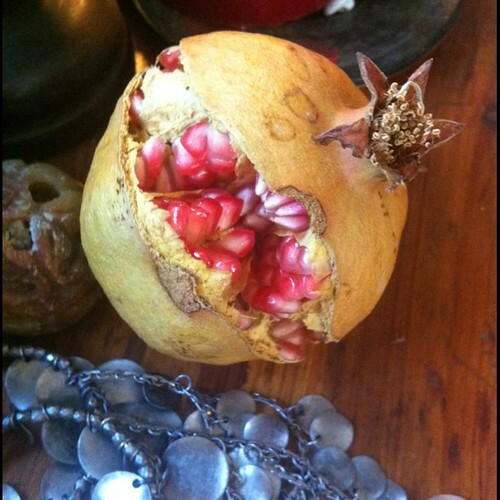 In modern times the pomegranate still holds strong symbolic meanings for the Greeks. On important days in the Greek Orthodox calendar, such as the Presentation of the Virgin Mary and on Christmas Day, it is traditional to have at the dinner table “polysporia”, also known by their ancient name “panspermia,” in some regions of Greece. In ancient times they were offered to Demeter and to the other gods for fertile land, for the spirits of the dead and in honor of compassionate Dionysus. When one buys a new home, it is conventional for a house guest to bring as a first gift a pomegranate, which is placed under/near the ikonostasi (home altar) of the house, as a symbol of abundance, fertility and good luck. Pomegranates are also prominent at Greek weddings and funerals. 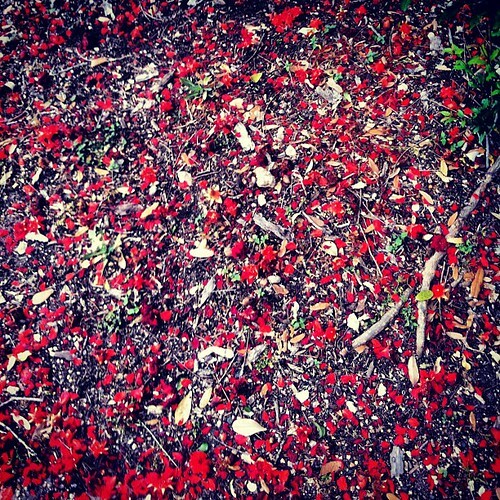 When Greeks commemorate their dead, they make kollyva as offerings, which consist of boiled wheat, mixed with sugar and decorated with pomegranate.It is also traditional in Greece to break a pomegranate on the ground at weddings and on New Years. Pomegranate decorations for the home are very common in Greece and sold in most home goods stores. 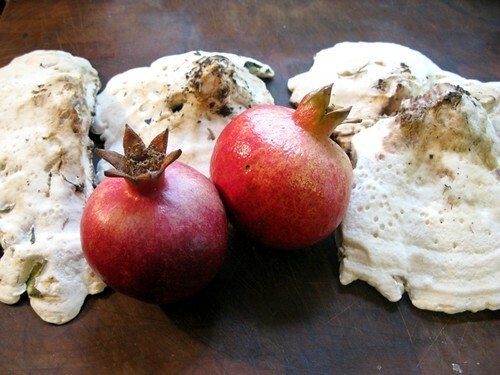 “In order to eat a pomegranate you need this many things: a pomegranate, a knife, a cutting board, a bowl and a towel. “This is our Central Texas fall, blue skies, an occasional floating shower that is gone too soon, luscious ripe prickly pear fruit,black juicy native persimmons, and pomegranate trees loaded with sweet heavy grenades. The pomegranate utterly drips with symbolic significance beyond our physical senses. It is also at once pleasing and teasing our taste buds – with that sweet pop of its edible ruby seeds, attained through the laborious task of consuming a few morsels at a time. The illustrious Punica granatum has an ancient pedigree. Not only does it appear in the Old Testament, but circles of Jewish scholars believe that it is actually the pomegranate and not the apple that is the forbidden fruit so fatefully consumed in the garden of Eden. According to same tradition, the pomegranate (rimon) is considered to be a holy symbol due to the held belief that the number of seeds contained in the fruit are equivalent to the 613 mitzvoth (commandments). The sacred rimon is used abundantly in Jewish ritual for a variety of symbolic implications. 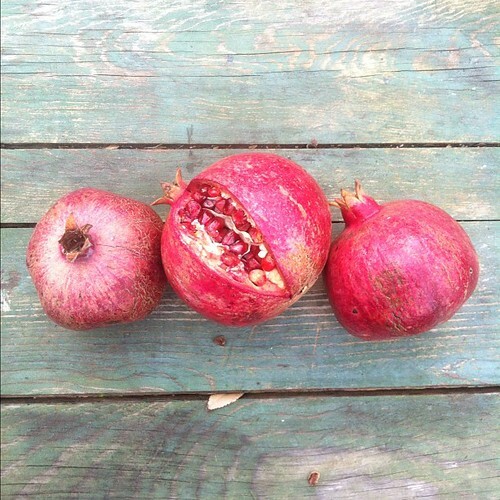 Our eminent pomegranate is called “Granada” in Spanish, meaning “grenade”, which its physical shape resembles. 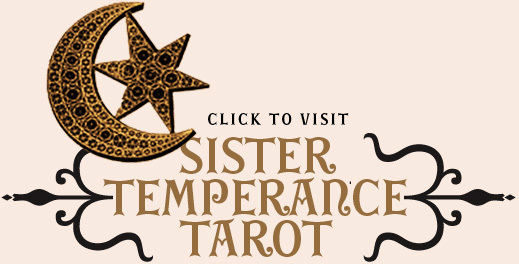 In the Major Arcana of the Tarot, the High Priestess and the Empress are both illustrated with imagery of the pomegranate. The High Priestess sits in front of a curtain adorned with the fruit’s likeness and represents intuitive knowledge and femininity, among other attributes. The empress, the mother figure, sits in the gown of pomegranates on her throne in a field of grain. She represents the seed and the harvest, and reminds us that we reap what we sow, to say the least. 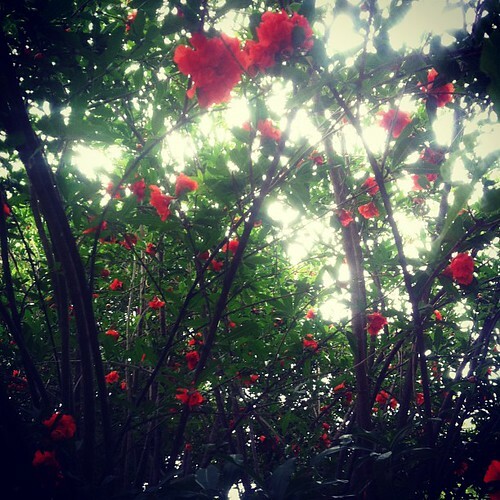 Punica granatum is universally a symbol of femininity, fertility and abundance. This long held belief is reinforced each autumn, when the pomegranate reaches its peak of maturity, coinciding with the season of plentiful harvest. Her majesty of fruits reminds us once more, that no plant is ever merely a plant. 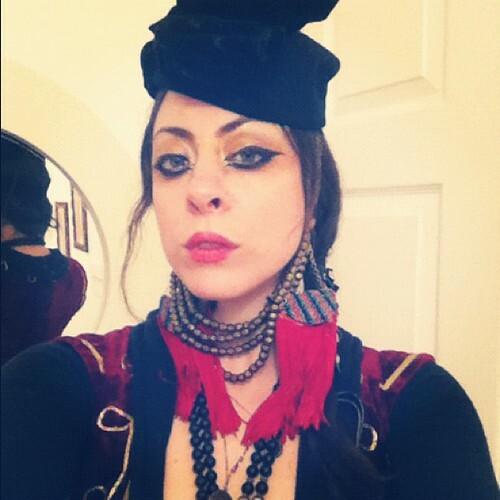 but an entire mythos unto itself. A behemoth pomegranate, just plucked from my tree. I took a bundle of them as potluck offering for a Full Moon Story Circle and potluck. 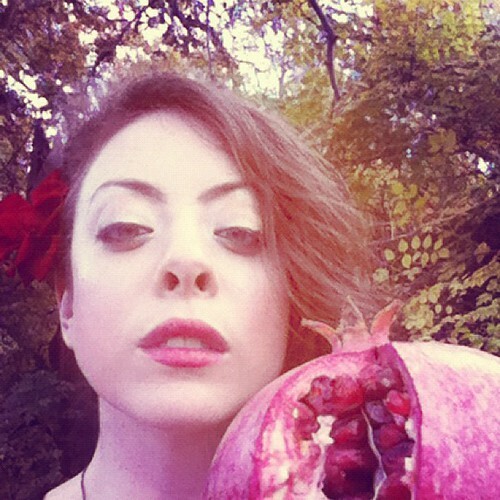 In the Garden of Eden grow pomegranates bigger than your head. Have a bite, won’t you? 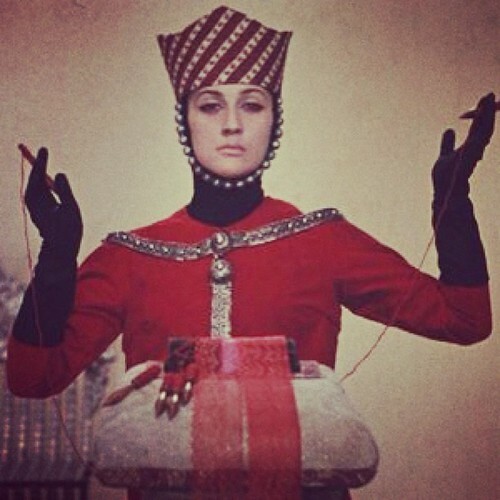 One of the greatest masterpieces of the 20th century, Sergei Parajanov ‘s “Color of the Pomegranate”, a biography of the Armenian troubadour Sayat Nova (King of Song) reveals the poet’s life more through his poetry than a conventional narration of important events in Sayat Nova ‘s life. 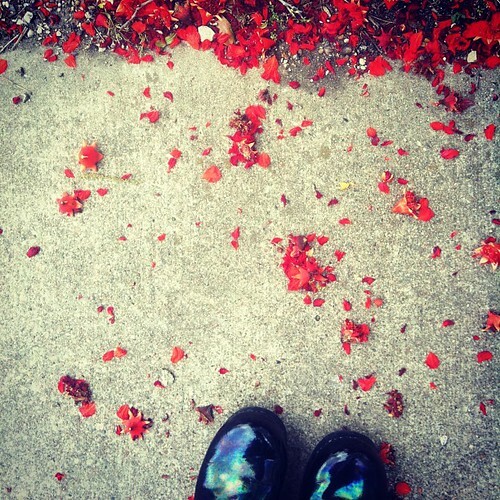 “Its rich, deep colors remind us also of the fall – midnight blues, blood reds, rich yellows. It really is a feast for the eyes. The whole film is a poem, both visually and cinematically. 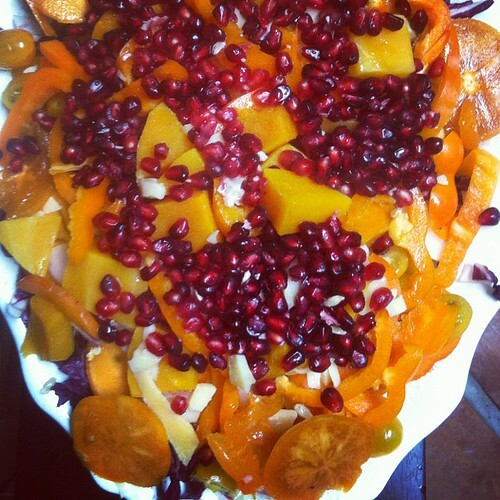 “The pomegranate is the symbol of Armenia and represents fertility, abundance and marriage. 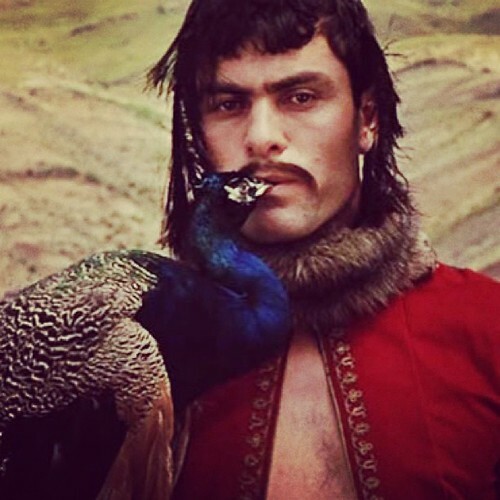 One ancient custom widely accepted in ancient Armenia was performed at weddings. 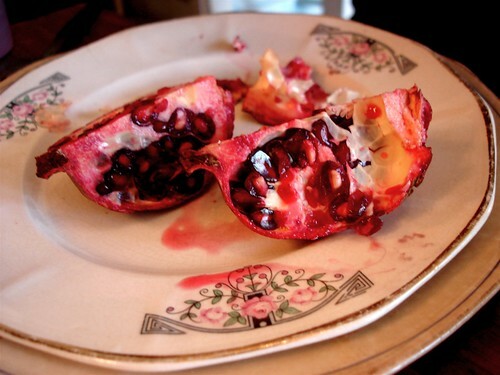 A bride was given a pomegranate fruit, which she threw against a wall, breaking it into pieces. 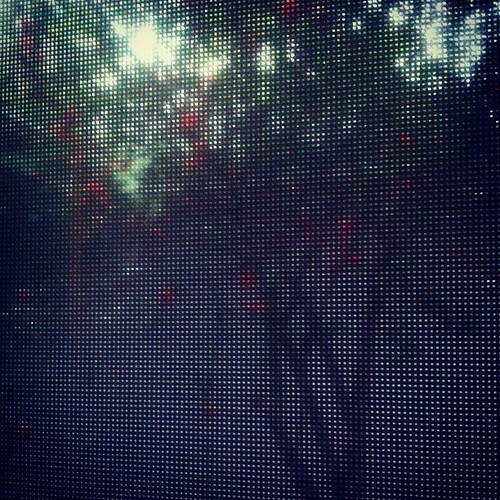 Scattered pomegranate seeds ensured the bride future children. In Artsakh it was accepted to put fruits next to the bridal couple during the first night of marriage. The pomegranate was among those fruits, and was said to also ensure happiness. It is believed the couple enjoyed a pomegranate wine as well.The symbol of the pomegranate is connected with insemination. It protected a woman from infertility and protected a man’s virile strength. Currently, pomegranate juice is famous with Armenians in food and heritage. “Thy lips are like a thread of scarlet, and thy speech is comely: thy temples are like a piece of a pomegranate within thy locks. The Tamil name maadulampazham is a metaphor for a woman’s mind. It is derived from, maadhu=woman, ullam=mind, which means as the seeds are hidden, it is not easy to decipher a woman’s mind. Oh so red, and such a lot of them. Whose Doges were old, and had ancient eyes. And barbed, barbed with a crown. And, if you dare, the fissure! Do you prefer to look on the plain side? For all that, the setting suns are open. Rosy, tender, glittering within the fissure. Do you mean to tell me there should be no fissure? No glittering, compact drops of dawn? For my part, I prefer my heart to be broken. And you will realize just how sick you have been.